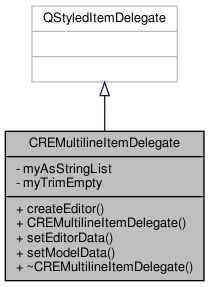 Definition at line 4 of file CREMultilineItemDelegate.h. Definition at line 7 of file CREMultilineItemDelegate.cpp. Definition at line 11 of file CREMultilineItemDelegate.cpp. Definition at line 15 of file CREMultilineItemDelegate.cpp. Definition at line 22 of file CREMultilineItemDelegate.cpp. Definition at line 33 of file CREMultilineItemDelegate.cpp.